My first time behind the counter in a bakery with all of the tempting food within easy reach! As promised, here's my tasty treat for you - a report about my behind-the-scenes visit to Nature de Pain with Meeting the French. 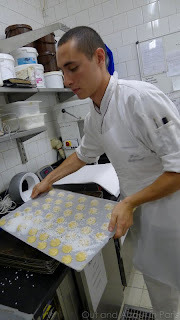 Since I've been checking their website and waiting somewhat impatiently for their tours to resume after the summer holidays, I was pleasantly surprised to receive an email from Solène Colas asking me to join the new bakery tour. Taking a circuitous route from the Villiers metro station to the rue de Levis turned out to be fortuitous because it gave me the opportunity to see a bit of this charming neighborhood where small shops abound. With luscious fruit, roasting chickens and fresh vegetables, the street is a veritable food lover's paradise. So, it's not surprising that Loic Bret picked this prime location to open his bakery in May 2010. As many of the people who take the bakery tour aren't familiar with French breads and pastries, Solène started by showing us the traditional pastries, like eclairs and tarte au citron, before moving on to the bread. Nature de Pain uses natural yeast that is made in the bakery to produce 800 baguettes per day and 30 different types of bread, including traditional ones, like farmer's bread and walnut bread, and innovative aromatic breads such as tomato and basil and another one with dried figs. Imagine savoring a slice of that with Camembert or foie gras! Our next stop was to see the four machines that are used to make bread. I'm sure that you recognize the giant mixer on the left. But what about the other three - any ideas? As I hadn't taken the time to eat breakfast before leaving home, watching the pastry chef make these delectable creations topped with sugar proved to be a real test of my will power. I can't tell you how tempting it was to grab one of them off of the tray when they came out of the oven. And the smell - heavenly! 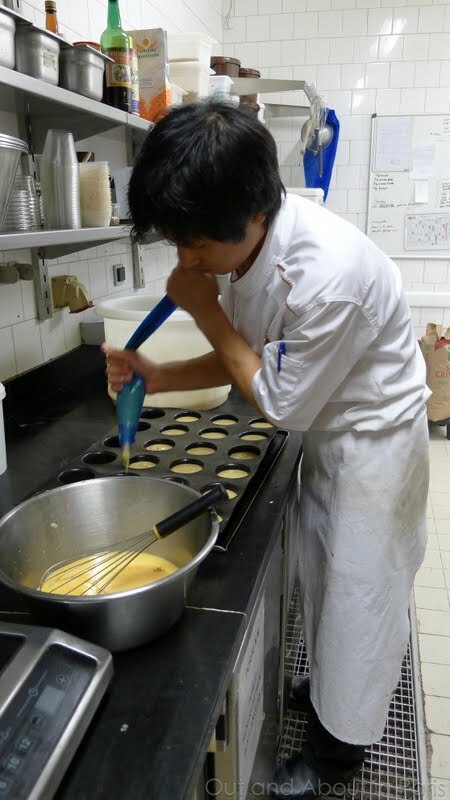 Solène explained that Mr. Bret likes to give apprentices from other countries, such as the Japanese pastry chef seen in the photo on the left below, an opportunity to work in his bakery for a couple of months. I wonder if they need an inexperienced intern from the United States. And, if so, would they pay me in chocolate eclairs? But since we had to forego the hands on experience of making a croissant and cutting the all important slits in the top of a baguette because the two other people taking the tour were late, I unfortunately missed what could have been my entree to a new career! My disappointment didn't last very long though when we were invited to sample a small slice of the farmer's bread, the tomato basil bread and 1/2 of a macaron. While we were savoring each bite, Mr. Bret answered questions, including one that I had about the "Best Baguette" competition in Paris. 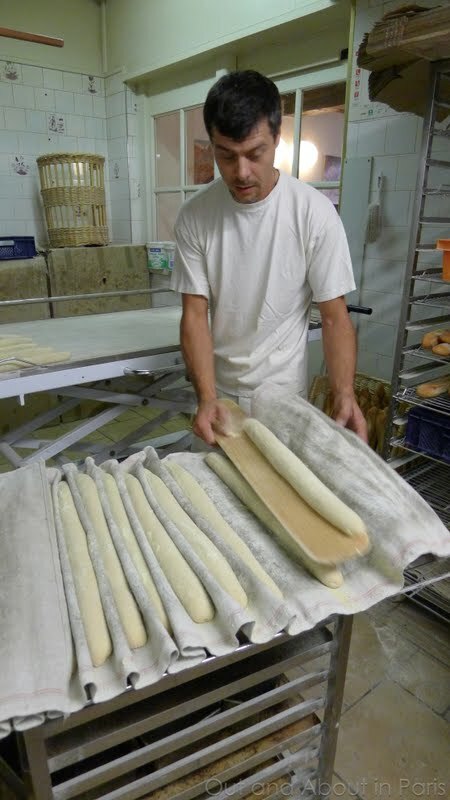 Holding a freshly cut baguette in his hands, Mr. Bret explained that this sort of competition restricts a baker's creativity because each baguette must meet very stringent criteria regulating the length, weight and shape. He added that his objective is to make the best baguettes according to his own definition and not to produce generic ones. 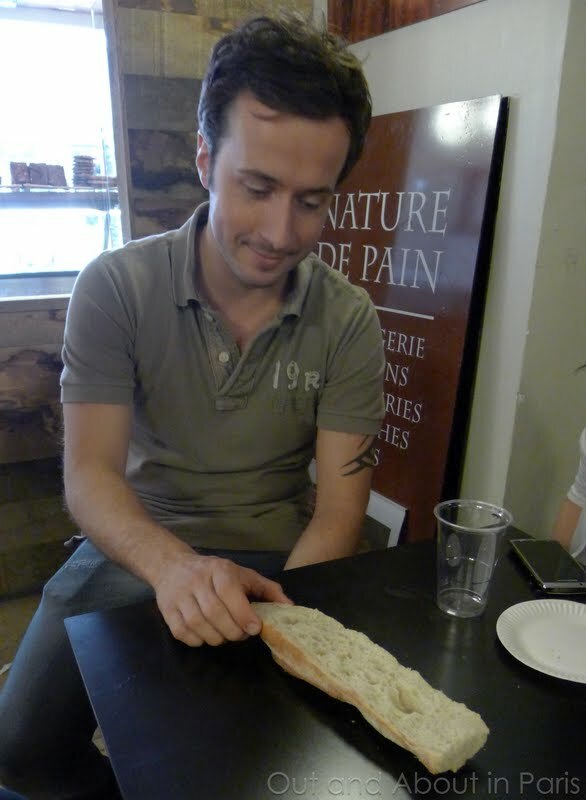 When I sampled the baguette that is included with the price of the tour, I can confirm that he has achieved his goal! Please contact Meeting the French if you would like to do the 20.00 € behind-the-scenes tour of the Nature de Pain bakery. If your schedule does not allow you to do a tour, Nature de Pain's freshly made sandwiches, assorted quiches, salads, wraps, and travel cakes, such as brownies and cookies, make excellent items for a picnic. The taboule salad and the spinach and goat cheese quiche that I purchased were delicious. Open every day except Sunday from 7:30 a.m. - 9:00 p.m.
Full disclosure: As you may already know, I've written about quite a few of the tours that I've done with Meeting the French. When Solène invited me to join this tour, I gladly accepted knowing that it would not compromise my objectivity. After all, my opinion of a bakery tour cannot be bought with a mere pain au chocolat...even though it was REALLY good! You can read about the other tours that I've done by entering "Meeting the French" in the search field at the top right-hand side of the blog. I LOVE Meeting The French tours!! LOVE! What a great experience. I too would apprentice for the price of an eclair or two. We did this tour in June and really enjoyed it too. After enjoying boulangeries in France for 3 weeks, it was interesting to see how our favorites were prepared. The translator was very good, and the bakery manager was very gracious to share time in his obviously busy day with us and to answer all our questions. (We were the only two people on the tour!) 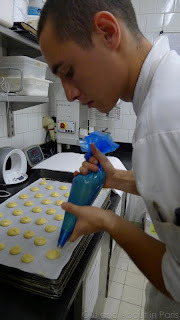 The products that we sampled during the tour, as well as those we purchased before and after the tour, were delicious. It was amazing to watch the steady stream of customers going in and out. We enjoyed exploring the neighborhood and market street after the tour. Rue de Levis is very interesting and Parc Monceau is nearby. It was fun to get out of the center of Paris, and easy to do by metro. Anonymous, Thanks for posting and telling us about your experience at Nature de Pain. Like you, I was on a small tour with only 2 other people. It was good because we could easily see the bakers and pastry chefs. One of the things that I like about Meeting the French tours is that they usually take me to new areas of Paris. Like you, I wasn't familiar with Rue de Levis but I really liked it and will definitely go back. With all of the food stores, it's like a less touristy Rue Montorgueil. My plan is to get some food from Nature de Pain and then have a picnic lunch on one of the benches in the Parc Monceau. Mmm, looks delicious! 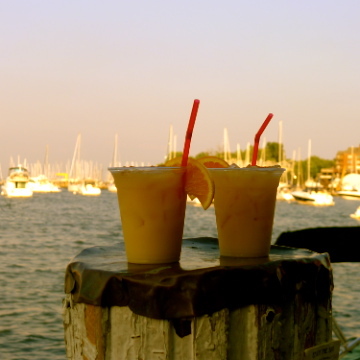 Wish I were there right now. Nycgirl, It was delicious! And after seeing your photos on Any Port, I know that you appreciate a good pastry...like a strawberry tart! I'm the Korean girl who took the tour with you. it's really fantastic to see the pictures. and these are make me remind those beutiful memories in paris with my sister. I'll stop by your blog more often!! Hello Jinhee. I remember meeting your sister and you on the tour. I hope that you enjoyed your time in Paris and that it won't be too long before you're able to visit again. Thanks for stopping by and leaving a comment! What's in season at the market in Paris? Swimmers in the Seine! What's happening? What gives me the heebie jeebies in Paris?